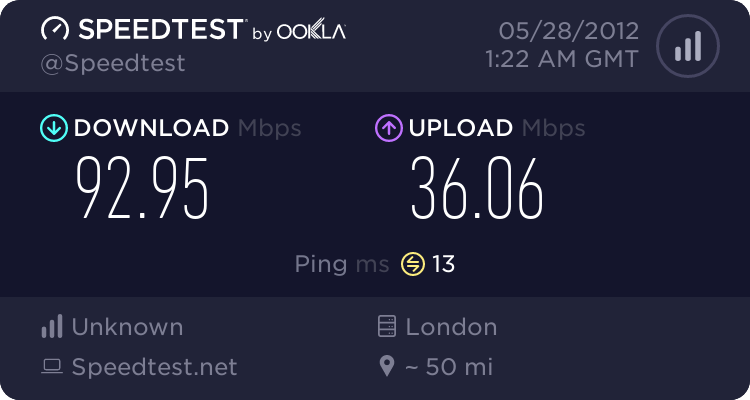 Are there any current or future 2-way satellite based broadband systems which operate at something like 40/10 speeds? There are fundamental issues with offering "super fast" satellite. The signals have to travel huge distances from the ground station up and back to the client. High Latency can only slow transfer rates. Satellites are expensive, to pay for them you need a massive amount of customers using them. Bandwidth is money so over subscribing it is a necessity. higher speeds means potentially smaller footprint as they need more bandwidth and power to achieve it. all this has cost and reduces potential customer count. The UK gov however seem to think Satellite is then next best thing to "BT" so expect to see a lot of money thrown at it in the future perhaps when the subsidised "fibre" targets are not met. The fact they think this is the answer only emphasises how disconnected they are from reality. While I do not subscribe to the satellite being the answer for superfast and it fails on the easy expansion to much higher speeds, it is worth pointing out that it is one of several techs being considered to help them understand the costs for the final 5%. Four at least of which appear to be fixed wireless. This is a chance for the alt-nets to show that they can actually do what they have said for some years but never being given a chance with public money before. In a perfect world similar pilots would have taken place for BDUK phase 1 with evaluations at the end, but I don't think people would have waiting till now to do the evaluation on say the North Yorkshire project. Have chased one sat operator and not impressed with the replies to date. For a single property that is miles from the next nearest place and with limited line of sight routes then satellite is an option and install times mean it can be done quickly with no need for other infrastructure in the area. Yes, partly why I asked the question on this forum. It is slowly becoming clear where the not-spots and slow-spots shall be in my locale once the Phase1 BDUK money has been spent. And it is not obvious yet where the Phase 2, SEP money shall be spent. For truly very remote and sparsely populated locations I can see why a Satellite solution may make sense. My locale is nothing like that. I just wanted to make sure there was nothing on offer now or in the very near future which is able to offer anything like 40 or 80Mb connections, which although may not be needed by many right now, that could change in the next 8 to 10 years. Indeed I am trying to make it clear that these people should not be throwing their money at Satellite broadband as long term it is not a solution which scales well when they want to obtain 80Mb speeds in 6 to 8 years from now. From this year up until about 2020, the second generation of Ka-band satellites should start coming into service and offering internet access with download speeds of up to a maximum of about 30-50Mbps across Europe and beyond. From 2020, the third generation of Ka-band satellites should start coming into service and offering internet access with download speeds of up to a maximum of possibly 100Mbps. What, if any, second or third generation Ka-band satellite capacity will be targeted at the UK market and at what price to the consumer remains to be seen. Inevitably, satellite broadband is going to play a short to medium term role in genuinely rural areas where there is little or no prospect of access to a basic or superfast broadband service being delivered by BT Openreach anytime soon, if ever. Satellite broadband does offer access to the internet to those in genuinely rural areas, but at a price and with limitations. A perfect solution? No, but better than nowt. I agree there are some locations a satellite based solution makes sense, your message has help set my expectations more reasonably. With reference to the pilots, including Fixed wireless, the conditions placed on that bid process were heavily weighted against FWA operators. I may be wrong by my view on this is there looks to be an intention to discredit the technology by tying these companies up in so many knots that they will ultimately fail. From this BDUK can say they have tried it and then confirm the EU view of "fibre only" or short term satellite is the only way forward. The fact the conversation emanating from .Gov at the moment is either Fibre or Satellite kind of reveals this. The latter has no need for infrastructure investment either so becomes a neat fix to the final X% after all the money has been spent on OR solutions. As i mentioned in another post, Satellite will also please OR as it poses no real threat to their business at all and will ultimately result in further funding later on to replace it with whatever OR solution is available at the time. It will be a quick fix for the current government though and tick the relevant boxes on the targets to meet sheet. What is the right thing to do is not what will invariably happen, this has been proven throughout history when Government interferes in technology industries. It isn't their money they are spending after all.